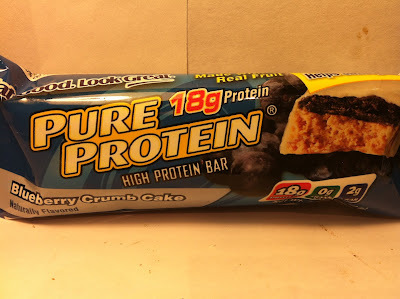 The quest is over...this is the final Pure Protein bar review as I've finally hit all the flavors (until they introduce a new one) with this Blueberry Crumb Cake bar. This one was picked up at Meijer on sale for $1.00 and contains 190 calories with 18 grams of protein. It seems like kind of an odd flavor and is similar in composition to the Strawberry Shortcake bar, which I hated, so I was kind of apprehensive about eating this one. As you can see in the picture, this one is pretty much the same as the Strawberry Shortcake bar. It's coated by a yogurt "icing" that flakes easily and the inside consists of a blueberry jelly type mixture on top of the crumb cake. The cake, while not flaky like a normal cake, is not nearly as solid as the normal protein mix. It's still solid and dense, but it's not quite to the level of what I've come to expect in these bars. After my first bite, I had the same impression that I did with the Strawberry Shortcake bar...the blueberry "jelly" was weird. I gave it a second bite though and realized that this "jelly" was actually really kind of appealing. They packaging says it was made with real fruit and usually I would doubt that in a bar that is this manufactured, but in this case, I actually believe it to be true. The blueberry flavoring was sweet and tart like a real blueberry and was also quite strong. In fact, when mixed with the yogurt outer coating, I would say it was borderline delicious. As for the crumb cake, well, it was just boring. It was slightly chewy like a normal protein mix, but the flavor was just bland. If I had to compare it's flavor to anything, I would say it was less like a cake and more like a pie crust. That's not necessarily a horrible thing, but I'm sure that's not what they intended. It didn't add anything or take anything away, so that's about all you can ask, I guess. Buy It or Fly By It? 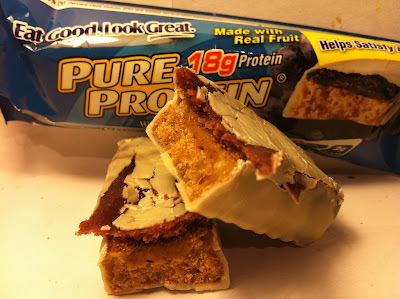 This is actually one of the more appealing Pure Protein bar flavors, so I would say definitely BUY IT. The blueberry and yogurt combination worked perfect with each other and if you can get past the boring "crumb cake", you are probably going to actually like this bar. I know I did. 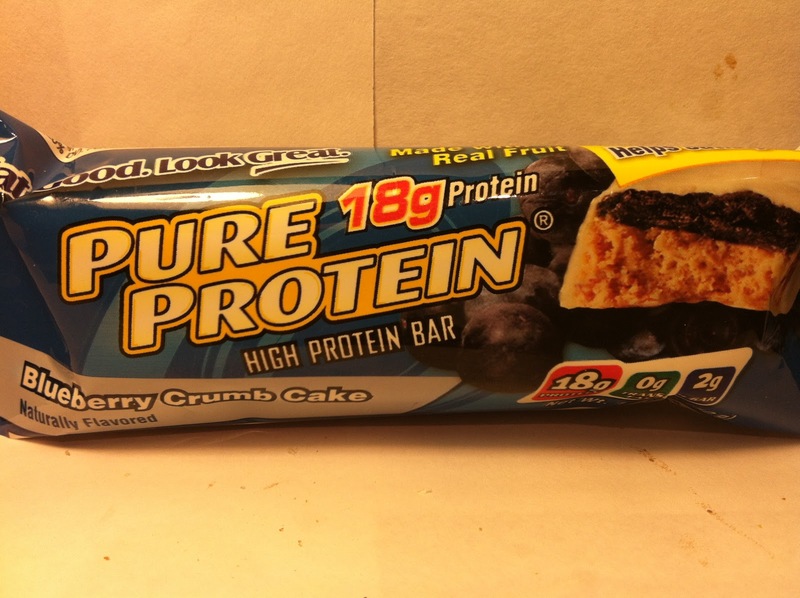 I like all the pure protein bar very much but blueberry crumb cake is very delicious. THe only reason is it includes bluebarry jelly type of mixture on top of the crumb cake. WHen I first time took a bite I relized that jelly was actually kind of appealing. I gotta try this one now. I really like the smores flavor one, and have just stuck to that one.